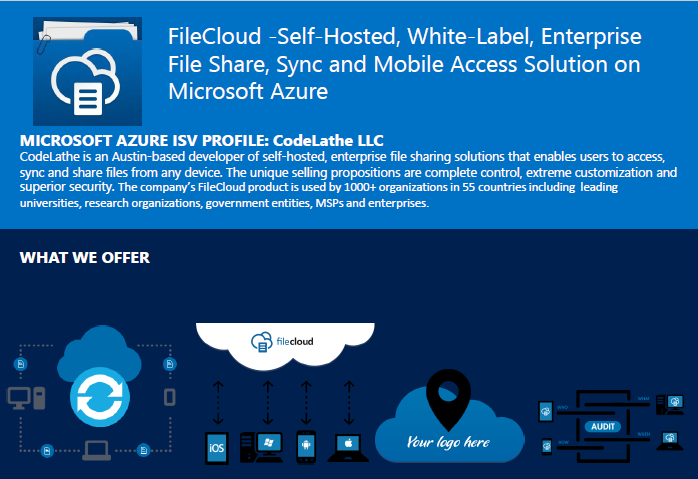 AUSTIN, TEXAS – Dec 21, 2015 – CodeLathe, the leader in enterprise file sharing and sync (EFSS), announced today that FileCloud now adds support to Microsoft Azure File Storage as a backend storage. The FileCloud integration with Azure File Storage allow businesses to deploy high available, redundant and scalable FileCloud hosting on Microsoft Azure without any complicated setup. Businesses can also easily scale their FileCloud as they add more users and workload. Azure File Storage offers file shares on Azure using the standard SMB protocol (SMB 3.0). It is built on the same technology as Blob, Table, and Queue Storage to utilize the availability, durability, redundancy and scalability offered by the Azure platform. FileCloud empowers corporate IT departments, and managed service providers to create their own secure file sharing and sync platform. FileCloud is a pure-play software solution, businesses can choose to deploy it on-premise or on public cloud IaaS services. 1. Complete Control: Ability to deploy on-premise or on cloud; offers total control over user access and hosted files. 2. Extreme Customization: Unparalleled branding and customization options to broadcast the organization brand. 3. Superior Value: Create value for customers by providing simple pricing, product innovation and fanatical customer support. Global 2000 companies trust FileCloud, across all industries in 65 countries around the world. Pricing for FileCloud starts at US$999/year for 20 licenses. Additional user licenses cost just US$25 per user per year. For more information or to try FileCloud on Azure, please visit https://www.getfilecloud.com/filecloud_azure/ or call 1-888-571-6480. 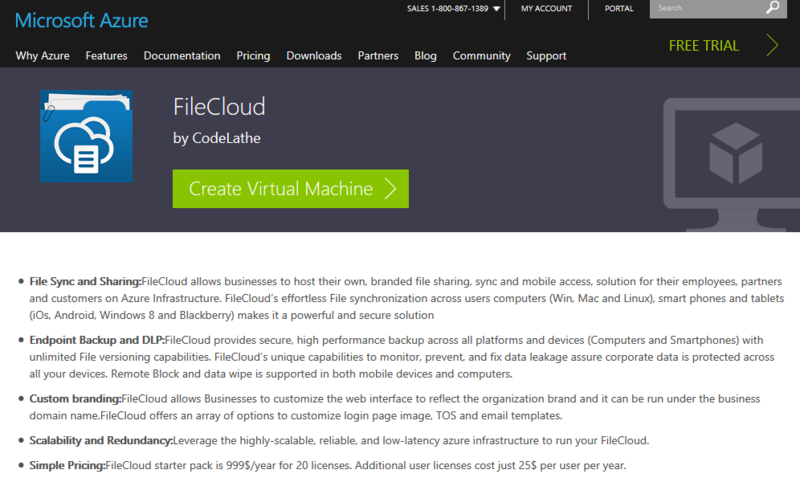 AUSTIN, TEXAS – Aug 05, 2015 – CodeLathe, a leading provider of private and customized cloud solutions, announced today that FileCloud is now available through the Azure Marketplace. The availability of FileCloud for Azure will allow businesses to host FileCloud in the Azure infrastructure. Customers will experience FileCloud’s superior control over enterprise data and its industry leading customization capabilities bolstered by Azure’s scalability, and resiliency. FileCloud empowers corporate IT departments, and managed service providers to create their own secure file sharing and sync platform. Since FileCloud is a pure-play software solution, businesses can choose to deploy it on premise or on public cloud IaaS services depending on their needs. The important differentiators between FileCloud and the other file sharing, and sync solutions include: the ability to self-host on-premise or on the cloud; and its unique data security implementation that monitors and fixes data leakage, which is a critical component for clients in financial, government, and health sectors. Global 2000 companies trust FileCloud, across all industries in 55 countries around the world. Pricing for FileCloud starts at US$999/year for 20 licenses. Additional user licenses cost just US$25 per user per year.